With the Adobe interface, how does one change the order of the keywords after acceptance? I know how to do it with the Fotolia interface, but can't see how to do it with the Adobe interface. While in the dashboard section of the portal, select the image you want to update. Scroll down the page and you will see an image preview with the keywords adjacent. Hover your mouse over the keywords and the edit (pencil) icon will appear. Click it and the keyword update interface will appear. Okay great thanks! Somehow when I selected the image I "saw" the "delete" and "Make profile image" selections and didn't even notice that the title, category and keywords were editable when hovered over. Yes, that's a hidden blue pencil, to get into the editor. Tricky until you know it. 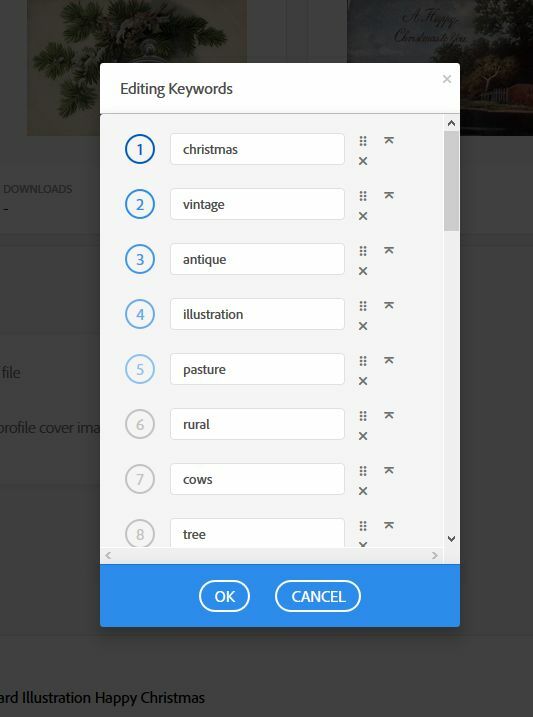 As another upgrade, it would be great if there was an option to switch to a text box when editing keywords of already accepted images. Most websites have this option - we can just copy paste the whole list of keywords and the system splits the keywords automatically at each coma, while retaining the order since it's important for Adobe Stock. I've tried editing an existing image but when I copied the whole list, it just pasted it all in one keyword field. So I had to manually enter them one by one in each field - which is quite time consuming if you're working on a series. Really? I never added more than updates and a few better words, maybe removed some. Good Idea! Some way to paste strings of added keywords. I never would have noticed.